Cylindrical Grinding is the grinding of the outside diameter of components revolving between centres or while held in a chuck. Cylindrically ground parts are more accurate in size with better finish than those turned on lathes. International's versatile range of cylindrical grinding wheels are used for a variety of grinding operations that require size generation, fine surface finish and fast stock removal. 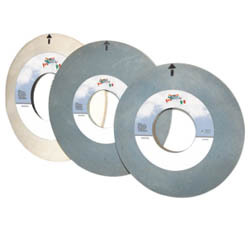 Special wheels are available for multiple diameters and shoulder grinding with the side of the wheel where wheel gradings are adjusted for plunge grinding without any traverse. Landis, Kirloskar Landis, Churchill, Newall, WMW, Praga, Addison, HMT, Riat, Toshiba, Norton, Parishudh.